So today was the second day of fall, and it happened with a sudden fierceness. No nice 70-degree, sunny days for us, jumping in piles of leaves and sitting by the fire pit. No, we went directly into rainy, freezing weather. Well, maybe I’m exaggerating a bit, but it was really cold and rainy here today, and it was a shock to my system! It’s really hard to go from gorgeous 80-something weather to what we had today. My body needs to be broken in slowly! Am I alone in this feeling, fellow southerners? I know I’m not. This morning I made Maddie wear a little zip-up sweater to Bible study, which she did not like, and as we walked from our truck into the church a light drizzle began falling. Maddie braced herself against the wind and looked up at me with a scowl on her face and said, “When is it going to be summer?” I just shook my head and laughed. I do look forward to fall and all that it entails. I’m not going to make a bucket list like I did last year-it’s just too much pressure. I do, however, have lots I want to do, like having fires at the fire pit and going to the fair. 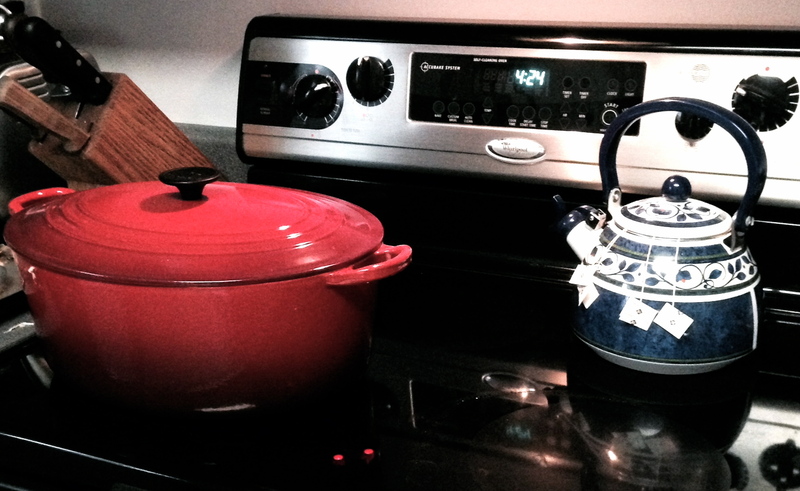 That’s right, I brought out the dutch oven and the tea pot. I drank hot green tea all day (The kids did, too-I am going to have to get decaffeinated next time!) and we had chicken and dumplings for dinner. Already I can feel us moving into our winter schedule of early suppers and bedtimes, and while part of me dreads the long, hard winter the weathermen are predicting, I am also looking forward to slowing down a little, to losing some of our summertime responsibilities, and to catching up on my DVR’d shows.